There are lots of books out there with wide arrays of crochet patterns and tips and tricks that, to be honest, can be found free of charge most the time. I find myself to be hard pressed to find a good crochet book that is really useful to me. 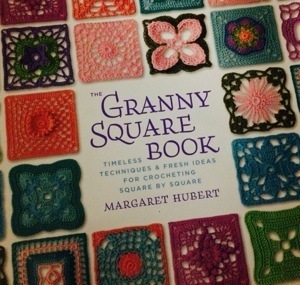 One such book that I have managed to find is The Granny Square Book by Margaret Hubert. This book is full of nothing but beautifully delicious granny squares. The granny square has been around for as long as our grannies have been, pun intended. In the 70’s they were plentiful in the form of shorts, vests, and all other forms of clothing. The beauty of the granny square is that, while you can make them as large as you like, you can also make them smaller, more traditional in size. Because of this traditionally small size, it makes the perfect scrap stash buster! All of those little balls of yarn floating around all lonely and feeling unneeded in the bottom of your stash or project bag can see the light of day again, or at least the light of the reading lamp by your bed. Granny squares can be sewn together to make just about anything from pillows to blankets to bathing suits to wash cloths to purses and so on. The Granny Square Book provides its readers with so many granny squares to choose from in bright attractive colors that the possibilities are endless.